I overheard a woman praising SFFA and giving copies of the Examiner article to others in the parking lot. She became informed at our Miraloma Presentation. I said a quick hello and thanked her. I hadn’t come since the chain saws went to work in earnest. But I decided to buck up and walk the loop. 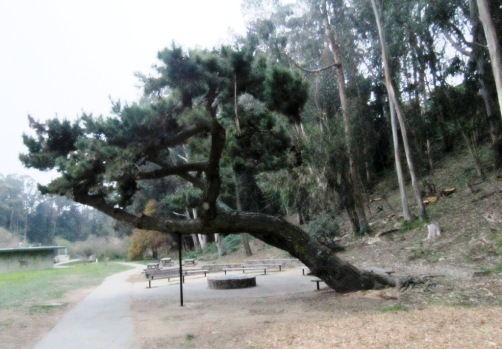 I particularly dreaded passing the big bushy conifer with the marvelous branch that reaches out over the park bench about 2/3 the way to the pond trail. The tree wore a pink tag and green spots last time I was there. Actually the last time I walked around, I got to the Grove as an ambulance was taking a careless young climber to hospital. So when we passed two little boys about to start up it I was silly enough to say, Be Careful. One of the boys looked at me and said, “You don’t need to tell me to be careful, I’m seven.” Anyhow much to my happy surprise, the tree was standing. It had a brace sunk in concrete under its long branch and the bench was relocated. What joy that once in a blue moon time the tree wins.